« It’s Not Just Pina Coladas! Though we’ve sailed it so many times, knowing we were leaving made me appreciate how beautiful San Francisco Bay is. 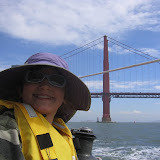 I snapped photos of Alcatraz, the San Francisco skyline, and Koiya at her favorite post: on the bowsprit, riding the waves and sighting seals and porposies. It grew cloudy and cold as we passed under the Golden Gate Bridge, but we were in high spirits. I wanted to break out the champagne that Mike had brought us, but Capn Bligh would not have a drunken crew, so the bubbly stayed in the fridge. So much for the forecast! The swells rarely hit seven feet, and the winds were light, and came first from the west, then from the east(! ), then from the west again. After raising and striking the main and jib twice, we finally settled on motor sailing, with just the jib flying. After a while, we gave up on the jib and just motored. The one good thing about motoring: Koiya could stay up on the bowsprit. Approaching Half Moon Bay, we passed thousands of moon jellyfish, and marine birds such as brown pelicans and surf scoters. Todd did a masterful job of backing the boat into our slip at the Pillar Point Marina. Mike’s sister-in-law Alita (who lives in Half Moon Bay) met us on the boat and Capn Boozy popped the cork on the champagne! Alita took us to Sam Chowder’s House, where Brian (Mike’s brother) met up with us. Though we’re just 30 miles from “home”, it feels much farther, and we were glad to get such a warm welcome! We’re now cozily tucked in at Half Moon Bay, with a light rain falling. The forecast is good for tomorrow, though, so we’re planning to head to Monterey then! This entry was posted on Friday, October 12th, 2007 at 10:30 am and is filed under Travel. You can follow any responses to this entry through the RSS 2.0 feed. Both comments and pings are currently closed. Very cool! I assume you played a celebratory game of CS:S since Mike was with you, yes? Congratulations crew of the Sugata. We’re sending good vibes your way! Watching Sequoia “bounce” around on the bowsprit — you’re made of better stuff than me, Sequoia! Congratulations to all of you from the Andersons as you begin your voyage — we look forward to tracking your adventures! Wow, congrats! Have a great trip and keep the updates coming! Way to go, guys! We had dinner with Jamie’s dad, mom and Paul last night, and your escapades contributed positively to the evening’s conversation. We had fun contrasting Susan’s newsy and witty journal entries with Todd’s somewhat single-minded engineering documentary. Jamie and Paul were very admiring of the painstaking care Todd has taken in that aspect of preparing for the voyage. We are all grateful that we can take part vicariously through your bulletins! That was the hardest part, getting out of the bay. It is all a downhill sledride (crabcrusher) from here. Please do not hesitate to ask me silly questions about bronze fittings in unexpected places and let me know if you ever get those hatch screens assembled. Just don’t leave port on a Friday, okay? Marcus, the not superstitious former Bligh of Restless. Hey!…I Googled for susan anderson, but found your page about Mexico or bust!…and have to say thanks. nice read.